August is coming to a close & kids are going back to school which means that Fall is almost officially here! What is your favorite thing about Fall? For me, I think it's the start of the holiday season that I love and the brisk Fall days that make sipping hot apple cider even more delicious. Warm comfort foods are a staple during this season--think chili and soups, and stews! For some reason I also ALWAYS have a strong desire to consume anything with pumpkin in it! There are so many great things about Fall. And now that David is getting a little older (and we are expecting another) it's time for us to start thinking of the different family traditions we are going to have. Looking back at my childhood, it's hard to think of any REAL traditions we had as a family. Occasionally, we'd go to a pumpkin patch to search for the ideal pumpkin, but as we got older that tradition faded away. I really hope we can keep our family traditions alive for 20+ years so that David and future baby will be able to look back and remember all the fun times we had as a family. 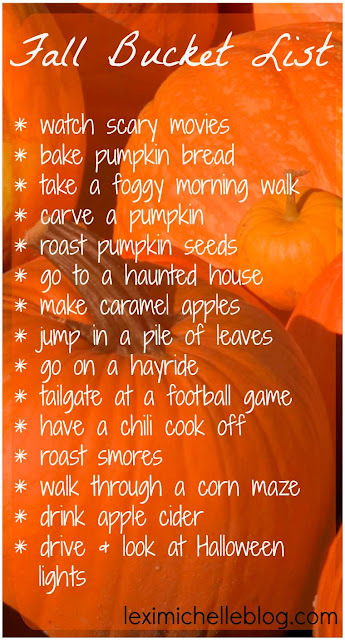 Here are some Fall Bucket List traditions I have thought up to get us started! What traditions do you guys have?